So I owe a heartfelt apology to my beautiful flock of egg laying chickens. I assumed they were huge wallet breaking feathered slackers after suddenly....80 chickens, no eggs. No eggs, meaning not even one egg. 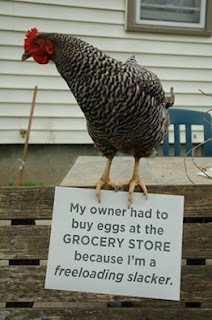 Horrors, I had to buy store eggs, a task I haven't had to submit to for many years, not to mention my CSA members who have included eggs in their orders wouldn't be getting their eggs, either. Yes, production wanes in the shorter nights of fall and winter, but this was like nothing I've seen. Like a faucet was turned off. So we were working in their barn and spotted quite the unusual sight: a giant black crow happily flying into the barn, navigating through the window, and managing somehow to get a just laid egg in its beak, and flying away. Then another. And another. So I've disparaged my birds unfairly. Egg-eating black crow bandits are to blame. Who knew there was such a thing? I'm sorry chickens!